Advanced driver assistance systems (ADAS) are systems developed to automate/adapt/enhance vehicle systems for safety and better driving. Safety features are designed to avoid collisions and accidents by offering technologies that alert the driver to potential problems, or to avoid collisions by implementing safeguards and taking over control of the vehicle. Adaptive features may automate lighting, provide adaptive cruise control, automate braking, incorporate GPS/ traffic warnings, connect to smartphones, alert driver to other cars or dangers, keep the driver in the correct lane, or show what is in blind spots. There are many forms of ADAS available; some features are built into cars or are available as an add-on package. Also, there are aftermarket solutions available for some late model cars. Advanced driver assistance systems are one of the fastest-growing segments in automotive electronics. 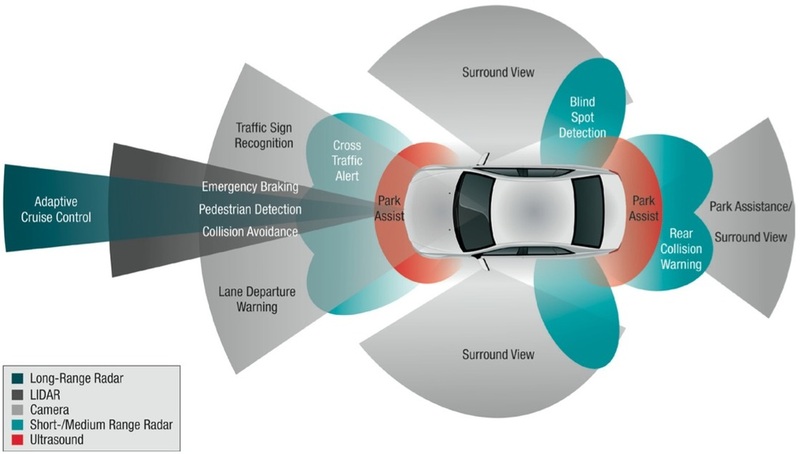 ADAS technology can be based upon vision/camera systems, sensor technology, car data networks, Vehicle-to-vehicle (V2V), or Vehicle-to-Infrastructure systems. Next-generation ADAS will increasingly leverage wireless network connectivity to offer improved value by using car-to-car and car-to-infrastructure data.